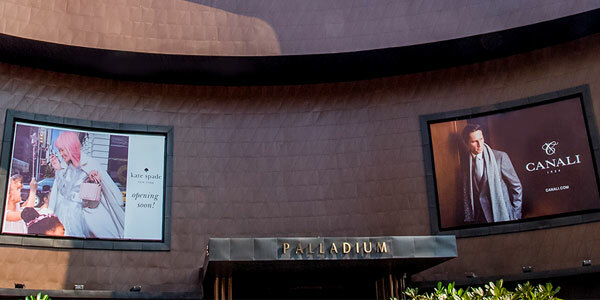 Since its launch in 2008, Palladium is a name synonymous with premium luxury retail. It’s not just a one-stop, high-end destination for shopping, it’s a lifestyle. After dominating the elite consumer segment in Mumbai, Palladium has opened a new chapter in Chennai. Located at Phoenix MarketCity Compound, Velachery, the mall has quickly become an iconic landmark. With its unique architecture, the Palladium complex stands out as a design statement in the Chennai landscape. With nearly 70 stores, the luxurious Palladium sprawl is home to a mix of retail and lifestyle. Besides luxury labels and high fashion brands, the mall is home to an assortment of cafes, fine dining restaurants, salons making it truly the one-of-its-kind luxury retail space in India. Palladium also provides for special services such as a concierge desk, WiFi and valet parking for all visitors. With plenty of accolades in the international arena, Palladium ranks first in both retailer and consumer preference – in terms of premium market share of globalised brands, as well as international services. While customers turn to Palladium for a truly international and exclusive retail experience, brands get to avail the ambience, audience and accommodation that only Palladium can offer. The mall not only promises rich and globalised culture but also acquaints the retailers with the Indian market through its extensive in-house brands. Currently, Palladium houses anchor stores like H&M, Shoppers Stop and multi-brand outlet – The Collective. Besides luxury brands like Canali, Tumi, Coach, Hugo Boss, Paul & Shark, Satya Paul; and premium labels like Michael Kors, Atesber by INC 5, Horology, Dune, Vans, Woods, New Balance and Pavers England Jones; Palladium also comprises of the iconic salon – Toni & Guy, and Thai Spa. Palladium is thus a testament to mixed used development, offering a wide variety of choices to appeal to all segments of consumers – across the board.